As stated below, on New Year's Day, Heather and I braved the Chicago cold to make a pilgrimage to Hoosier Mama Pie Company, in West Town. 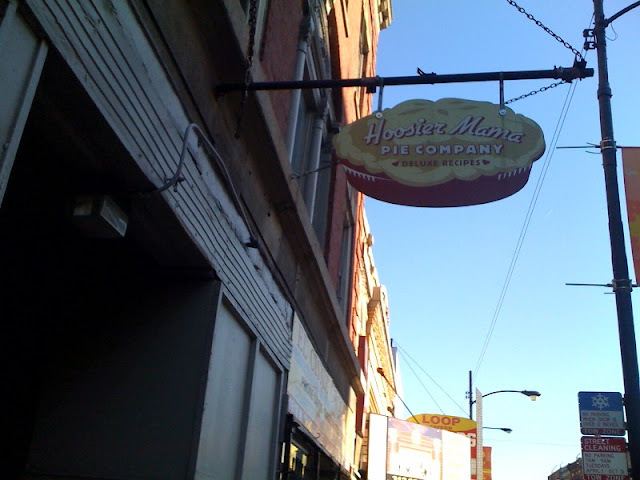 Hoosier Mama is an adorably tiny pie shop, with a whole lotta pie, and a pie philosophy that really resonates with my own-- local culture, tradition, history, whole foods, women's domestic arts (see video below for more on this), as well as Hoosier pride. We even got to meet the Hoosier Mama herself (stirring on the left). It took Heather and me a long time to figure out which 2 pies to try--Hoosier Sugar Cream & Pear Apple Cranberry? Maple Pecan & Lemon Chess? via the "$5 sweet slice + coffee for here! ", and took our treats to the built-in booth in the bay window. and browsed their awesome collection of old pie cookbooks, The Farm Journal's Complete Pie Cookbook, being my favorite. As you can see, Hoosier Mama is basically THE Pie Enjoyment Zone, and hopefully our New Year's visit will bring us in good pie for 2010. Hey Sam! Nice to see you here. We'll hang for sure next time I'm in the area, and I'll amend my geographical error! Dude, I cannot believe that wedding cake! It has ur name written all over it. I know. Though don't get me wrong, I do LOVE a cake on a special occasion (wedding, birthday). That's why your cake-pie, Mandy, was the jam--best of both worlds!